The morning after our Bishop Pass exit, the first thing we did in the town of Bishop was look for non-backpacky clothes. Wicking polyester, thick wool socks, and colorful bandanas are what you want on the trail (see Liz’s post ‘Check our pride at the trailhead’), but in town you kind of want to blend in with the locals. We were getting some looks even in this hiker-friedly town and when people ask ‘So, how long you been out?’ as a conversation starter you know it’s time to shop. Being a small, hiker-oriented town, we ran across approximately 15 gear shops and resale stores in our search for ‘normal clothes’. We were beginning to think people bought them in some other town when finally we happened upon a sight for sore eyes: KMart. Did you realize they have significantly ‘cooled’ since the blu e light special days? Or maybe I’ve significantly aged since then, and my definition of cool has changed. Either way we strutted out those doors in v-necked cotton and cargo pants, stinky backpacks in tow for under $75. Stylin’ and profilin’. You could almost hear Napoleon Dynamite ‘Suit Walk’ playing in the background. The next order of business was to secure accommodations. On foot this can be tricky – you want to APPEAR perfectly happy to walk out if the rate is too high, but inside you’re dying to put your pack down (I’m already sweating through my new shirt) and take a much-needed shower. 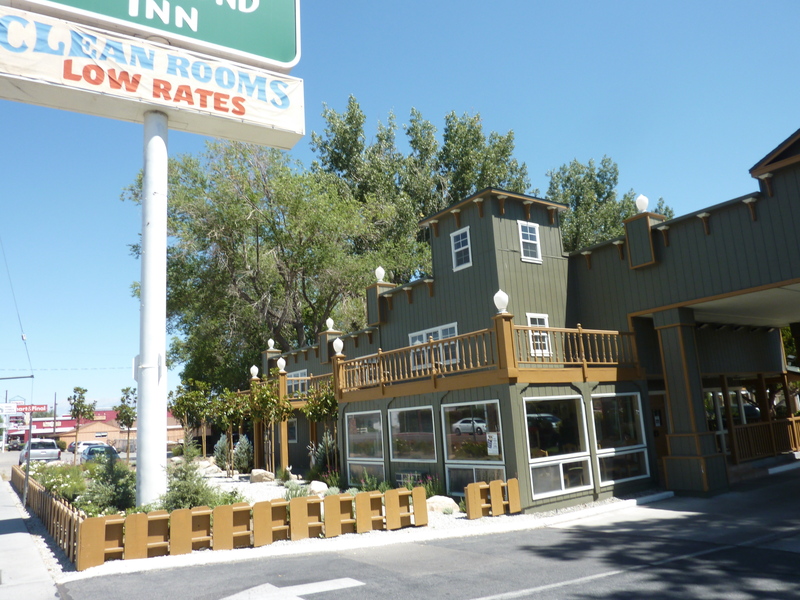 We checked 4 hotels on Main Street before deciding on The Vagabond Inn. It wasn’t the cheapest but the name fit our current condition. And it looked cool. For the next two days we lived the high life. Walking down to the Kmart or Vons grocery whenever we felt like it, perusing used gear shops at our leisure, and eating popcorn from Vagabond lobby at every convenience. Liz even took an Epsom salt bath. It was simply luxurious. The dining was great as well. Every good backpacker knows whenever you leave the trail you need to supplement your diet with high calorie, protein-rich, fatty foods to help cover the deficit. We tried our hardest at a range of local places. We only split one meal – again, true luxury. Since we were in a hiker town, we figured we could check in with a couple shop owners about good gear, advice on traveling around sans-vehicle, etc. We chanced into a shop called Sage to Summit (URL coming soon as a shout out) that proved a very fruitful venture. The folks in there watch you walk in your current shoes, note your gait and style (I guess I supinate) and then start fitting you for proper shoes. MUCH different than Dicks Sporting Goods sales associates. When it was all said and done two hours later Liz and I had both been fitted for shoes that felt a ton better and were a half size larger. Upon closer inspection my old shoes had started splitting at the seams near my toes after 500 or so miles, and we’re well aware of Liz’s foot problems. Shoe-related? We hope so! It wouldn’t be a town stop without a movie, so we stopped in at the Bishop Twin – that’s right, two screens – to catch The Other Guys. NOW we could check out of the hotel and start the trek toward home. Just three more days to kill. Back to Yosemite to see the sights! 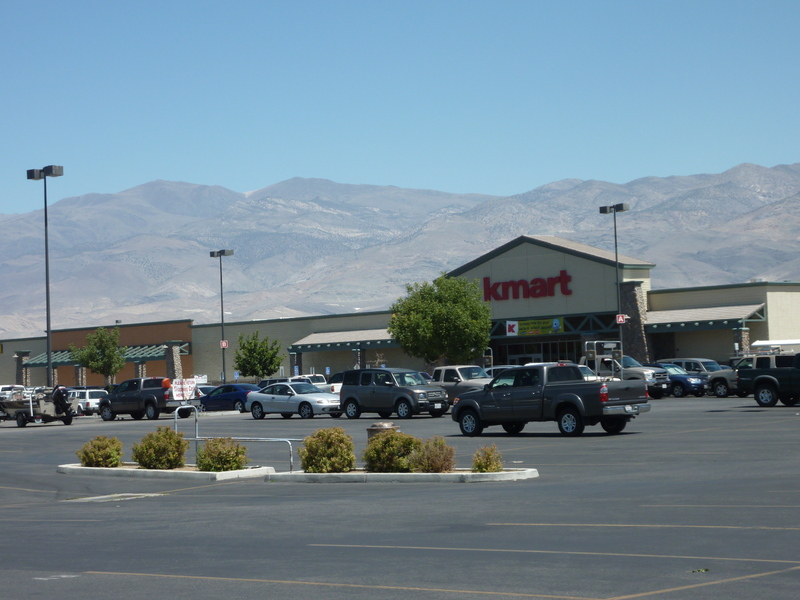 Ah yes, K mart. I remember it well! !